When Governor Jerry Brown earmarked $50 million of his state’s 2014 budget for the Awards for Innovation in Higher Education, it was a bold move, one that hadn’t been tried before. The rationale for the awards was simple: rewarding state colleges, universities, and partnerships that were creatively tackling issues which prevent students from getting their bachelor’s degrees in a timely manner. Typically, the state government funds higher education institutions through centralized bodies like the University of California’s Office of the President or the California State University Chancellor’s Office, which allocate resources using a formula that ensures every school gets a little bit. This makes it harder to direct money to innovative endeavors. Although other states have tried different approaches to tackle similar problems in higher education, California is unique because of its size and scope—which inspired Brown to try something new. The Innovation Awards were an attractive offer for the state’s UCs, CSUs, and community colleges, many still struggling to cope with the 2008 recession-driven budget cuts. Over the last six years, the state slashed a fifth of its budget for higher education even though enrollment numbers have steadily increased. To compensate, state colleges and universities were forced to think of creative ways to meet the needs of California’s students, many of whom require remedial classes when they first enroll in college. Despite a tough fiscal situation, administrators and faculty rose to the challenge. There were no specific definitions for what comprised innovation, which allowed for a wide variety of applications from public higher education institutions. Some of the applications focused on collaborative efforts between the colleges and their surrounding communities or the private sector. That’s the case for the California State University San Bernardino, which has partnered with local K-12 leaders, community colleges, CSU Riverside and two economic development agencies to form a collective to better prepare students for college and increase the number who graduate with a degree. In total, the project includes 56 school districts and 11 community colleges in two of the largest counties in the country, Riverside and San Bernardino. Half of his school’s new entrants are transfer students from local community colleges, which highlighted the need for a project that could aid the successful transfer of community college students into four-year degree programs—and ultimately, better prepare graduates to join Inland Southern California’s workforce. One of the biggest challenges, Morales emphasizes, is getting students up to speed on math skills. Which is why the collective is focused on developing a four-year math course for the surrounding school districts. Math—a statewide challenge—was a familiar refrain in the batch of applications submitted for the Innovation Awards. Student retention was another. 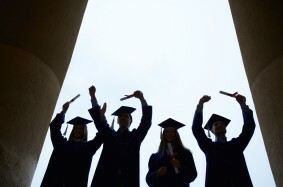 According to a report by Complete College America, over the last two decades more than 31 million college students have failed to earn a degree. Of the students who do graduate from public universities, less than 20 percent are able to finish college in four years. College preparedness is one of the greatest challenges higher education institutions face today. As employers increasingly require degrees, youth face more pressure to enroll in college in order to land jobs. Student retention was the main focus of California State University San Marcos, where more than half of the two thousand incoming freshman each year are first generation students hailing from underserved communities. The college won an Innovation Award for its “¡Si se puede!” project, designed to support students through their first year of college. The course is designed to introduce students to all of the resources on campus with modules that bring in faculty from the library, advising and career counseling offices. CSU San Marcos also hired a support person to ensure that students are enrolled in mandatory remedial classes that must be completed within the first year. “If they aren’t remediated by end of the first year, we have to let them go,” Formo explains. Since these were awards and not grants, there were very few restrictions on how and when the money could be used. Some schools wanted to replicate or scale up the programs that had garnered the awards whereas others wanted to try something altogether new, but still focused on student success, that would be difficult to do without such flexible funding. The academic support center can offer the kind of institutional support that middle classmen need. By anticipating issues through a data-driven process, the school hopes to develop new programs to move the dial on graduation and retention rates. Meanwhile, CSU San Bernardino has placed its $5 million into escrow in order to generate some interest while the school builds the foundation for its ambitious collective impact model. Building the infrastructure alone – to work with 56 school districts and 11 community colleges – is a huge task. Thus far, CSU San Bernardino has piloted a successful residential summer bridge program and developed a four-year math initiative. They’re also working on developing a data portal to track every student who graduates from high school in Riverside & San Bernardino counties to see if and where they go to college – and if they actually earn a bachelor’s degree. Ultimately, the collaboration aims to attract businesses to the region by offering an increasingly educated workforce. Doing so could turn the economic tide for the communities in the Inland Southern California. The award winners were then invited by College Futures Foundation and the Education Delivery Institute to participate in an Innovation Leadership network; participants came together in January of 2016 for a kickoff planning retreat were able to share information about their projects and end goals and get feedback from other awardees. Future network meetings are planned to stimulate ongoing innovation, identify challenges to scaling up, and support award winners in their communications efforts. Just receiving the award has generated interested from other departments across campus as well as neighboring community colleges interested in partnering with CSU Monterey Bay. Two schools, CSU Los Angeles and CSU Dominguez Hills, have visited the school to check out its math program. Irwin says she’s also fielded questions from out-of-state schools as well. CSU Monterey Bay is using its award to pay salaries and provide workshops for local teachers. “It’s bridge funding,” Irwin says. “We can start something new quickly.” She is counting on the money providing support for the next five years while the school replicates its computer science program with a second community college. Most would agree that the governor’s Innovation Awards have shown that those on the ground and closest to the action know what works. Although success in higher education is typically ascribed to elitism and selectivity, the innovation awards operate on a different premise—one focused on expanding access to college for students who have largely been excluded because of a variety of obstacles and are not typically seen as college material. Ultimately, the state’s strongest role is not to control, but to seed good practice and innovation. There are good ideas and approaches in the state’s institutions that should be highlighted so that others can replicate or scale them up. Although traditional funding from the state doesn’t enable or encourage innovation, awards such as these do.